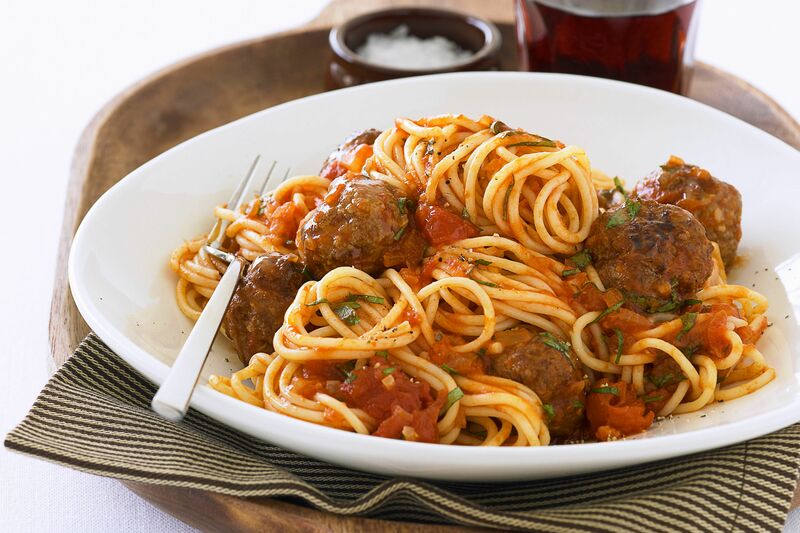 While spaghetti and meatballs may be the first dish you that comes to mind when someone mentions the word "meatballs," there's so much more you can do with these delicious balls of meat. From creamy pasta dishes to hearty stews, meatballs are surprisingly versatile for quick weeknight dinners and savory party appetizers. Sure, you could just toss a jar of store-bought marinara on top of pre-cooked meatballs and spaghetti. It may be quick, but made-from-scratch spaghetti with meatballs is the better option, in our humble opinions. We've found that it's too delicious to pass up! This classic recipe starts with fresh ingredients, from the homemade meatballs to the custom tomato sauce. It's easier than you might think, too! You can always use your homemade or store-bought frozen meatballs and just make the sauce a la minute. Swedish meatballs are another family favorite and they're not hard to make. That's especially true if you toss them into your trusted slow cooker. The recipe uses just a few common ingredients, including onion, garlic, and cream of mushroom soup. Serve them on top of rice, potatoes, or noodles for a fabulous cold-weather meal that's hot and ready for dinner. When you're ready for a change of pace, try this creamy pesto meatball recipe. It's absolutely delicious and incredibly simple because it's made in the crock pot. The recipe uses both Alfredo and pesto sauces from a jar. Season that with bell pepper, garlic, and onion, and add your meatballs. It's best served over steaming hot rice. Four kinds of cheese and a jar of Alfredo sauce combine to make this ultimate meatball mac and cheese. It's a baked recipe of cheesy goodness and takes just minutes to prepare, so it's great for busy families. It's also an excellent choice for a pre-made freezer meal if you like to plan ahead. Meal prep, anyone? Whether you use this recipe's homemade meatballs or your favorites from the freezer aisle of the grocery store, it's hard to resist meatball sliders. These little sandwiches serve as great appetizers, as well as provide a fun alternative to lunch. They're broiled to ensure the mozzarella is as gooey as possible, which is just one more reason why they're a guaranteed hit. We all know that Italian meatball sandwiches are amazing! But what if you take the ingredients apart? 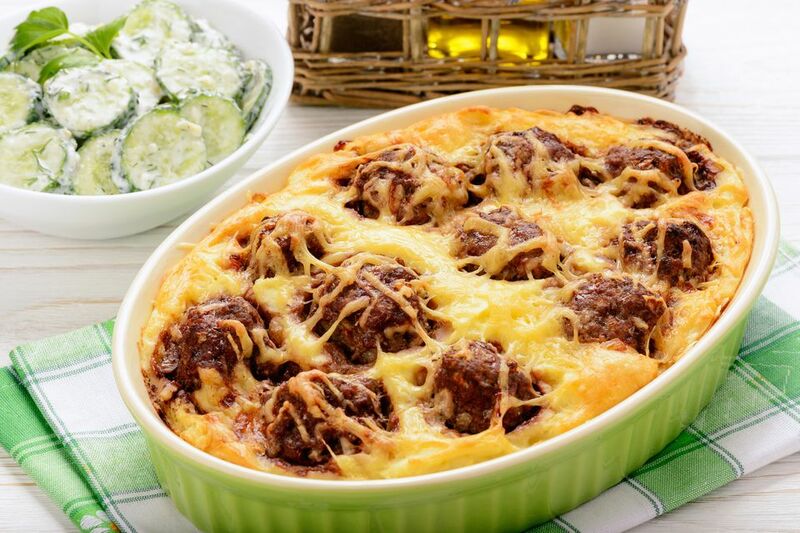 What you have left is this equally delicious deconstructed meatball sandwich casserole. The recipe has you make garlic bread and tomato sauce, with the option of using frozen meatballs or making your own. Pile it all in a dish, top it with cheese, and bake it up. It's a great family dinner. A staple in Southern cuisine, you have to try grape jelly meatballs to understand why they're a favorite. This is a phenomenal appetizer recipe that is sure to turn heads at any party. Use frozen meatballs if you like, then drench them in a sauce of grape jelly, chili sauce, and Dijon mustard. Another unusual appetizer option, cranberry cocktail meatballs are a big hit at parties. Skip the homemade meatballs and use frozen ones to make it even easier. It's the sauce that really counts, with its tangy blend of cranberries, chili sauce, brown sugar, and lemon juice. For a slightly more traditional party bite, you can't go wrong with beer and barbecue meatballs. Drenched in a homemade barbecue sauce that features any beer you like, this slow cooker recipe is perfect for game day parties and potlucks. A tailgating favorite, you may want to make more sweet and sour meatballs than you think you'll need. One taste and everyone will be back for more. The chunky sauce of this recipe combines pineapple and sweet pickles with soy sauce, brown sugar, ketchup, and cornstarch. It has a wonderful tang and zest that is anything but boring. Playing up the fruit and adding a real tropical flair, your family will be impressed with this slow cooker recipe. It's sweet and savory, combining meatballs with pineapple and orange along with bell peppers and a sweet and sour sauce. You'll even add toasted coconut before serving it over hot noodles with cashews. A hearty, nutritious homemade soup does not get much easier than this. This crock pot meatball soup requires just five ingredients, including frozen meatballs and mixed veggies. Let the meat-tomato base cook all day, toss in the last ingredients, and dinner's ready within an hour. Serving your family a good home-cooked meal is very easy with this thick and creamy recipe. This meatball and potato stew is a wholesome dish, filled with potatoes, carrots, and meatballs in a rich and seasoned broth. It's a great meal to come home to on a cold winter day. Frozen vegetables and meatballs come together for a delicious tomato-based stew that is sure to please the entire family. The recipe combines lima beans, carrots, potatoes, and tomatoes. At the end of a long day, simply add sour cream and chives and dinner is served. Orzo is the tiny pasta that makes an excellent alternative to rice. In this meatball orzo casserole, you can transform them into a risotto-like dish that's super easy. Packed with broccoli, onion, and garlic, it's as healthy as it is delicious.